A Foreign-Trade Zone (FTZ) is a site that is legally considered outside of the United States of Customs purpose of duties. Goods may be brought into the site duty-free and without formal Customs entry. The Paducah-McCracken County Riverport Authority administers Foreign Trade Zone #294 (FTZ), which allows shippers to import, store, exhibit, assemble, or manufacture without being subject to Customs entry procedures and duties. Zone users pay lower duty rates on goods produced in the zone when the finished product has a lower duty rate than the imported components and parts. Zone users will benefit by filing multiple Customs and Border Protection entries each week, consolidating multiple shipments to one processing fee payment. Reduces duty payment on import waste and scrap of imported goods during the manufacturing process in the FTZ. FTZ’s may transfer zone merchandise to other zone facilities without the payment of customs duties. Goods imported and stored in a FTZ may be exported without ever incurring customs duties, avoiding lengthy drawback procedures. The National Association of Foreign-Trade Zones, an association of public and private members, is the collective voice of the Foreign-Trade program. The NAFTZ is the principal educator and the leader of demonstrating the FTZ program’s value and role in the changing environment of international trade. The Foreign-Trade Zone Resource Center is a site that was designed to provide information to virtually anyone involved in the Foreign-Trade Zone (FTZ) program. 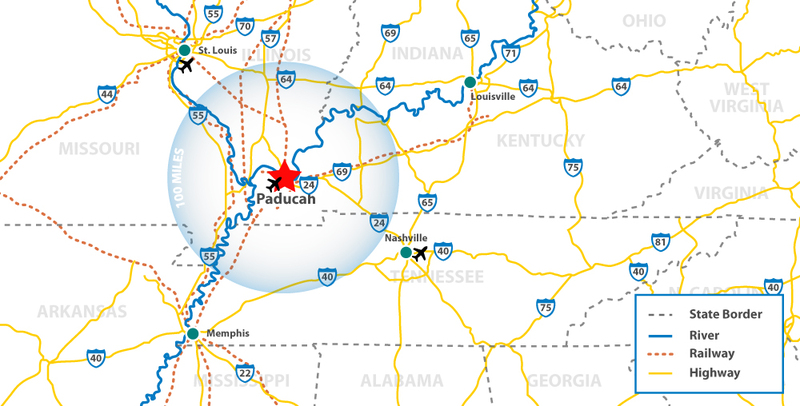 Greater Paducah Economic Development (GPED) is an economic development alliance whose mission is to serve as the catalyst for wealth creation in the McCracken County region of Western Kentucky. GPED will accomplish this by pursuing an aggressive agenda of business development — marketing the region — and product development — improving regional business conditions through policy, workforce, and research initiatives. Kentucky Economic Development is responsible for strengthening the state’s business environment and creating a more vibrant Kentucky economy. The SBA’s Office of International Trade’s mission is to enhance the ability of small businesses to compete in the global marketplace.